We have two bedrooms, one with a double bed and ensuite bathroom and the other has two single beds and an en suite bathroom. 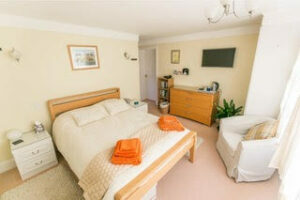 The rooms can be booked together for friends or a family or booked separately. 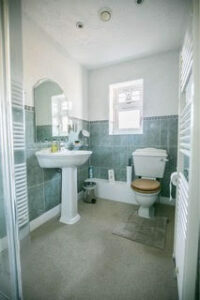 Both rooms have tea and coffee making facilities, television and complementary toiletries. There is a large kitchen where breakfast is left ready for you. It includes a s election of cold meats, local cheese, fruit juices, locally made yoghurt, freshly baked bread, croissants and home made jam made from fruit from our garden. Wadhurst and Crowborough stations are nearby but it is advisable to have a car as the bus service is limited. Gatwick Airport is a 45 minute drive away. There is ample parking on the driveway. There are several pubs and cafes serving good food, within walking distance of the house (10 mins). There are also places to eat in Rotherfield Village, which is a short distance away by car. Several National Trust properties are within an hours drive from the house. 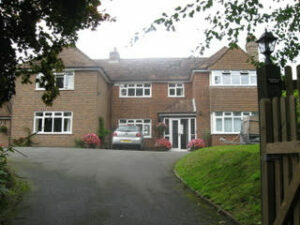 We aim to offer high quality bed and breakfast with a friendly welcome and comfortable accommodation.